The citizens of the U.S. have never been richer. 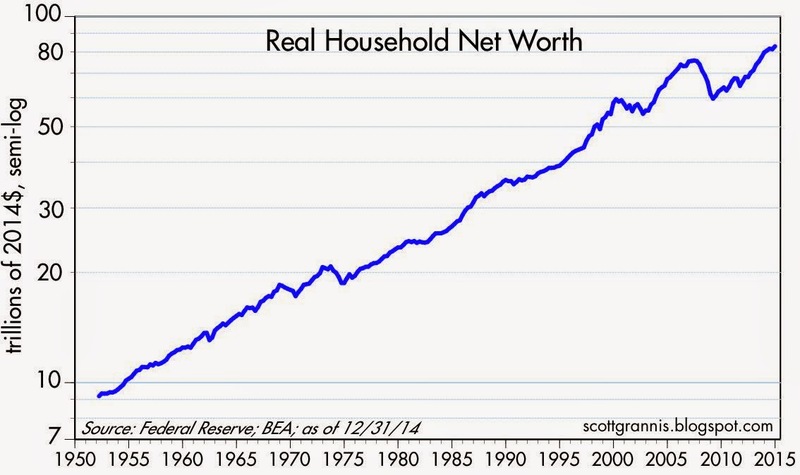 According to the Fed, household net worth in nominal, and real per capita terms hit a new all-time high last year. We could be a lot wealthier if we had had better fiscal policy (e.g., lower tax and regulatory burdens and less income redistribution), but at least things are improving. Progress is slow, but it is still progress. Gains in net worth have been driven primarily by gains in financial assets (equities, bonds, and savings), and also by real estate, which has recovered to levels last seen some seven years ago. In contrast, household debt today is about the same as it was over 7 years ago. 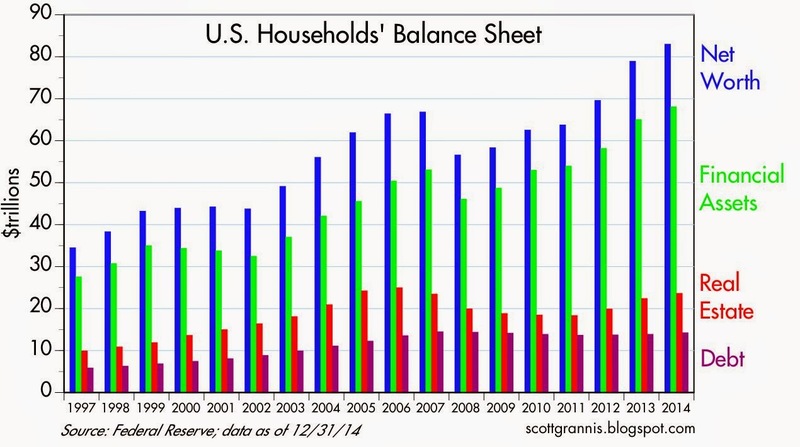 The wealth of U.S. households now stands at almost $83 trillion, up $4 trillion in just the past year. 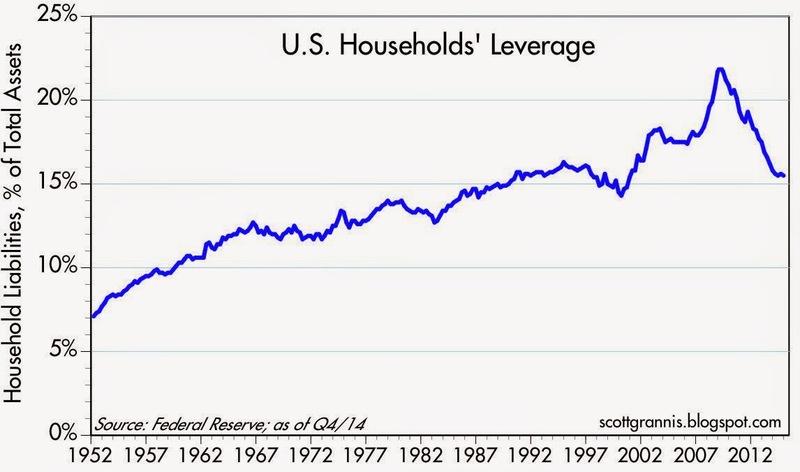 By cutting back on debt while financial assets and real estate prices appreciated, households have achieved a significant reduction in leverage, as shown in the chart above. In constant dollar terms, household net worth is now at a new all-time high, having finally surpassed the previous pre-recession (and bubble-like) high. 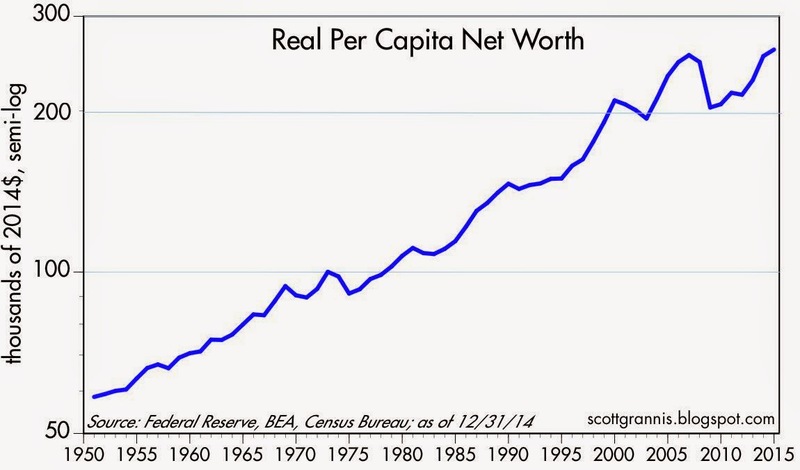 In constant dollar terms, per capita net worth is also at a new all-time high of $260K. This is all unquestionably good news, yet it stands in sharp contrast to the prevailing mood of the market—at least as I see it—which still exhibits a good deal of caution. Households have amassed almost $8 trillion in bank savings deposits, despite their miserably low yield. Nominal yields on high quality bonds are near record lows, and real yields on 5-yr TIPS are zero. The demand for safe, risk-free assets has never been stronger. Regardless, things are getting better, albeit slowly. But frustration over the lack of even more progress (e.g., the economy should be growing at 4-5% per year instead of only 2.5-3%) is not a reason to be pessimistic. Especially when the price of safety (i.e., the yield on cash and high quality, short-term debt instruments) is so high. If anything, this tells me that there is a lot of under-appreciated upside potential in the market and the economy, if we could only improve the outlook for fiscal policy. The S&P 500 seems about fairly priced on the pe's---is this caution or common sense? US institutional property fully priced. Recessions do happen. Slow growth seems the new norm, given very very inflation-averse central banks. The GOP says they want more spending not less. The Donks are hopeless. Scott wrote: "the economy should be growing at 4-5% per year instead of only 2.5-3%"
"It’s not because this time around things are different. To the contrary, the song remains the same. "For a long time, nearly four decades, growth has been getting progressively weaker during each recovery from recession. This trend of weaker growth is present in all major developed economies. "There are two key drivers behind this declining trend: demographics and lower productivity growth. Yes, it’s true that we’ve seen pretty good U.S. jobs growth recently, but that comes with productivity growth slamming down to zero." William--the Fed has used every recession since 1980 to move to a lower level of inflation. Why they chose to do that in the case of the 2008 recession is a big mystery---or maybe just public agency ossification. Re ECRI's explanation for weak growth: that's hardly a satisfying explanation. The real question left unanswered is "why has productivity growth slowed?" Several answers come to mind: business investment has been weak, transfer payments have been rising relative to incomes, regulatory burdens have been increasing. Businesses are investing less because tax burdens have increased, and the economy has become less efficient in its use of critical resources because government has imposed new burdens on nearly everyone. Finally, increased transfer payments create a disincentive to work. There are thousands of market observers who say we could/should have better fiscal policy (lower taxes and reg burdens, less income distribution, wiser gov't spending). Btw, this is always true. My question (and I'm not exposing my opinion just yet): Without resorting to emotion (political ideology, faux patriotism, or jersey cheering), I'd love to get feedback as to what readers think about whether or not the fiscal policy metrics are indeed getting better or worse. We all know what the hope is; I'm trying to ascertain the reality. My two cents: fiscal policy was generally getting worse (higher marginal tax rates, increased regulatory burdens) for most of the past decade. The outlook has improved on the margin in the past year or so: tax rates are unlikely to rise further, and regulatory burdens may begin to decline. My hope is that the negative trend in fiscal policy has indeed been arrested and may begin to improve in coming years. I note that the burden of government spending (spending as a % of GDP) has declined (improved) substantially in the past four years, and this has likely offset some of the other negative trends (taxes, regulations). Dear Scott, with all do respect at my age of 73, I know that during the expansions of 1970 - 1973, 1975 - 1980 and 1980 - 1981 when growth was 4.3% to 5.1%, US income taxes were vastly higher than they have been since the Reagan tax cuts and the Bush Tax cuts of 2000 when expansion growth was only 2.8% from 2001 to 2007. Further it is well known that the banking industry and other industries were deregulated by Democrats and Republicans in the late 1990s. It is also well known that the Bush / Cheney administration appointed heads of the EPA, FDIC, etc.. etc. who were against enforcing regulations already on the on the books. Thus, since the Bush tax cuts (resulting in the lowest tax rates of my 73 years) and the deregulation of industries and lax enforcement of rules on the books, the GDP GROWTH RATE DURING EXPANSIONS AFTER 2001 HAVE BEEN MUCH LOWER than when taxes were vastly higher and regulations were enforced more vigorously. There are the facts about the effects of taxes and regulation on growth rates; and there is the dogma about low tax rates and deregulation. Unfortunately, the facts do not support the dogma. - when income, capital gains and dividend taxes were the lowest of my long life. And when significant deregulation of industries had been accomplished and when the Bush administration was lax on enforcement. If your theories were correct, the US economy should have been in NIRVANA. NO?? Transfer payments as a % of income have increased from 15% to almost 20% in the past decade. Relative to total GDP, they have increased from almost 12% to almost 15%. More people are getting paid to do nothing, and those who are working hard are picking up the tab, giving them a disincentive to work. The financial crisis was caused by a combination of tight money and massive government intervention in the mortgage market (Fannie Mae, Freddie Mac, Community Reinvestment Act), not by high taxes. Since 2009 the burden of government regulations (e.g., Dodd Frank and Obamacare) has increased significantly. Marginal tax rates increased significantly two years ago. Since late 2008, the number of people receiving food stamps has increased from just over 30 million to almost 48 million. Paying people who don't work does not increase their incentive to work. The number of people receiving social security disability benefits has increased over the past decade from 8 million to almost 12 million. The asset bubble is in full force; real estate and stocks are in nutsville once again. This time it won't be pretty.